I've just finished three weeks working for Oxfam's Rohingya crisis response team in Cox’s Bazar and can remember one moment, standing in the pouring rain in the Rohingya refugee ‘mega-camp’. Everywhere I looked, ramshackle shelters made of bamboo and tarpaulins stretched into the distance. People old and young were trying to find shelter from the downpour, and large puddles were quickly forming across the narrow brick road, with water running down sandy hillside paths. As I was trying to take photos of a deep tube well Oxfam was drilling to provide clean water, numerous Rohingya refugees offered to take me into their shelters to stay dry, or brought me umbrellas. Such was the kindness of people who had endured unspeakable horrors that forced them from Myanmar into neighbouring Bangladesh. The camps are in what they call the pre-monsoon rains at the moment, where every couple of days a ferocious storm will hit for an hour or so. This rain is nothing like I’m used to. The falling water has an almost physical quality, beating down on you, and the rain can be so heavy you struggle to see the other side of a road. Trees are often blown over in the wind, and almost immediately, huge puddles form everywhere, slowing cars and trucks on the sandy, brick roads and draining into refugees' flimsy shelters. 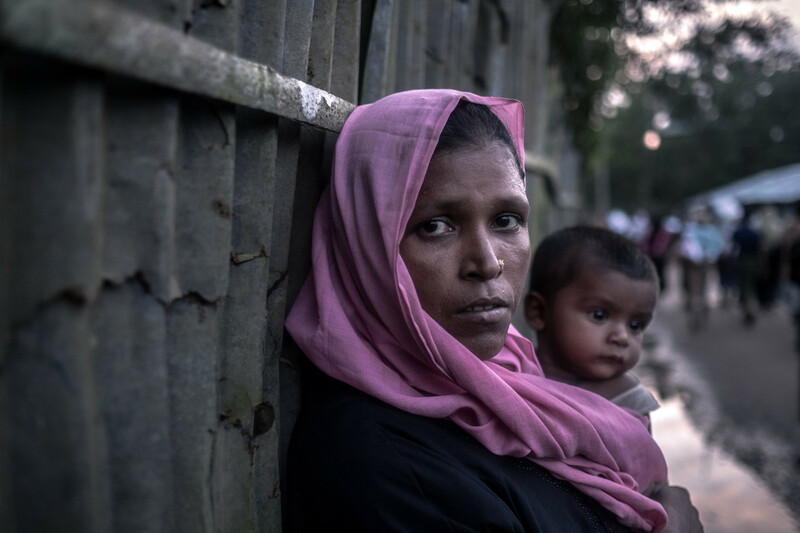 It's estimated that more than 600,000 people are living in the Rohingya refugee mega-camp alone - a bigger population than all of county Cork in Ireland. How the full monsoon is going to impact this many people in such desperate living conditions is what’s top of mind for aid workers. Yet despite this, I was struck by the way in which Rohingya refugees could find hope in what appeared to be a hopeless situation. They are denied citizenship in their country – they feel they have nowhere they belong and have nowhere to call home right now. No-one knows what their future holds. They're awaiting monsoon rains likely to bring floods, landslides and potentially deadly water-borne diseases. 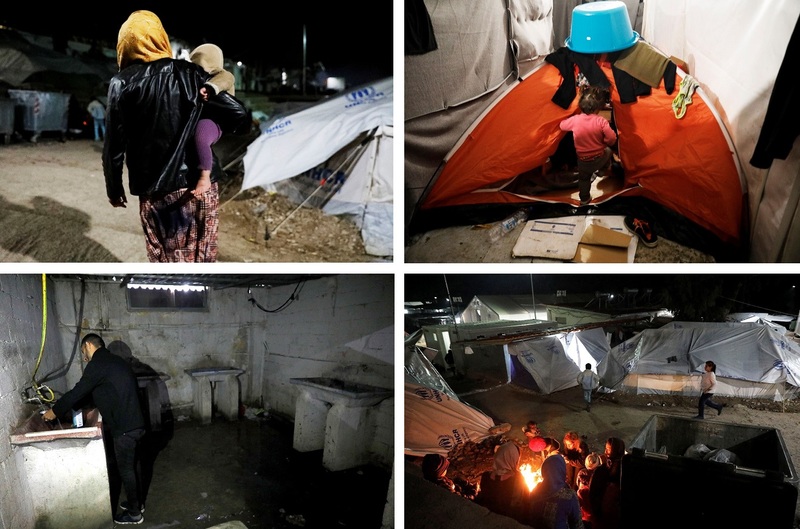 The United Nations (UN) estimates up to 200,000 people are living in at-risk areas of the camps. As much as 2.5 metres of rain could fall on the camps over the next three months. But, the refugees I met certainly weren't hopeless or despairing. Parents were working hard to strengthen their shelters or volunteering for charities like Oxfam as community health trainers or with the UN as camp labourers helping prepare the camps for the coming heavy rain. This included a young woman I met called Ayesha*, who was 18 years old. 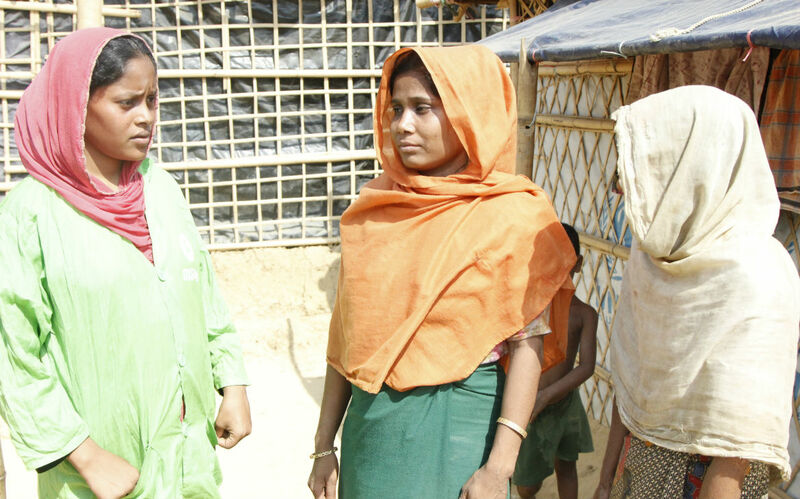 She fled to Bangladesh with her mother and three siblings after their father was killed in the violence in Myanmar. It took them nearly 5 days to get to Bangladesh by boat and foot; others weren’t so lucky and drowned when their boats sank. Life is tough in the camps without a father or husband - women can get missed or sidelined at aid distributions, and culturally, young women are not supposed to go out alone. None of this had dampened Ayesha’s spirit. She put up her hand to volunteer, and now runs community health trainings with her neighbours and other women. She told me, "Now I work as an Oxfam volunteer, I teach people how to maintain good hygiene and I tell people what to do to have a good life. I feel good about it". As for the children, they played football wherever they could find space, and ran through the camps in happy bunches and practised English with aid workers - "goodbye, how are you, I am fine." 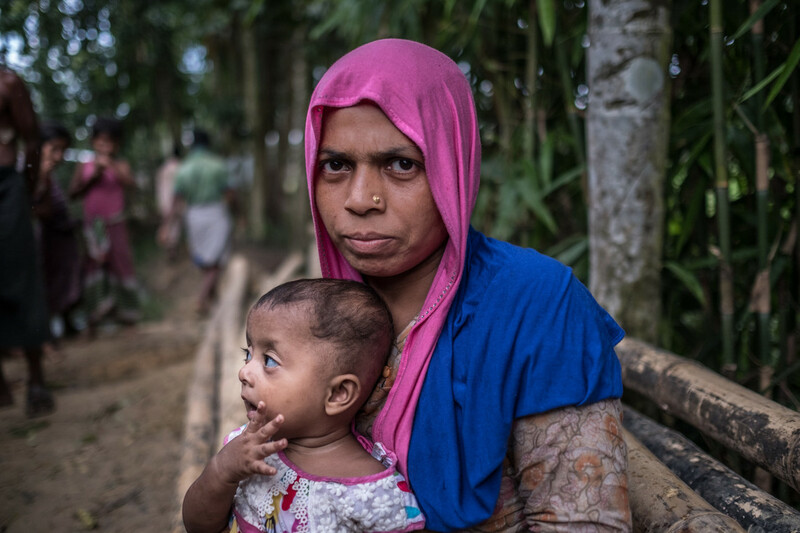 Oxfam is in Bangladesh, providing food and life-saving clean water to those fleeing Myanmar and the host communities that have opened their doors to them. 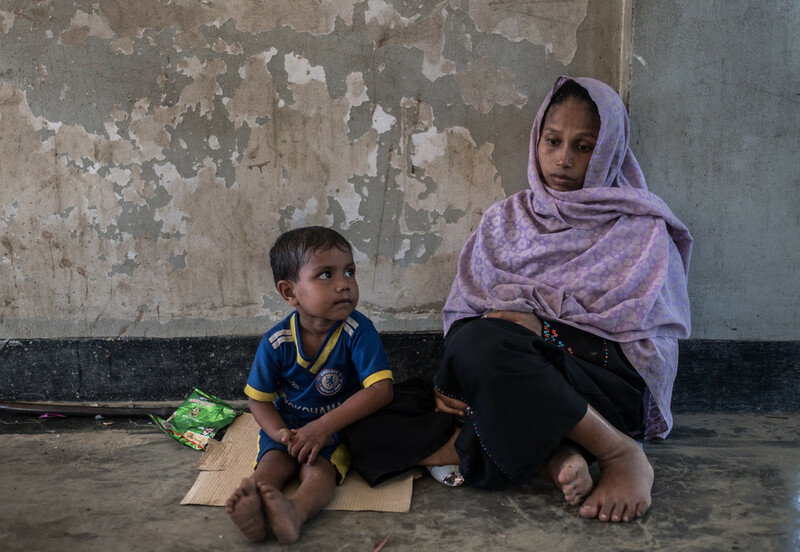 But we desparately need your support as more and more traumatised men, women and children arrive in Bangladesh every day. Dylan Quinnell was media manager for Oxfam’s Rohingya Crisis Response for three weeks in April/ May. He is senior media coordinator for emergencies at Oxfam Australia. How can we go back to a Syria that no longer exists? The harrowing news from Eastern Ghouta – the scene of intensified fighting in Syria’s brutal conflict – has pushed the war into the headlines again. Recent fighting in other areas, including Afrin, Idlib and Deir Ez-Zor continues to claim lives and leave families in desperate need of aid. During this protracted crisis, the broken lives of Syria’s women, men and children have too often been ignored. Left: Hani*, 16, was displaced from East Ghouta in 2013, and now lives in a tent with his family of 8 in Herjalleh, Rural Damascus. Photo: Dania Kareh / Oxfam. Right: Wael* and Husam* return back from their daily journey to collect drinking water for their family from a nearby water fountain, Herjalleh. While making a film about Syrian refugees in Lebanon and Jordan for Oxfam, I was truly humbled by the courage and resilience of the people I met. However, many are only just surviving amid harsh conditions. One Syrian young refugee in Za’atari told us she is creating her own luck, developing her writing skills as a reporter for a magazine on the camp. Now 20, Abeer hopes she will return to Syria one day and she has made it her goal to give something back to her country because of the way ‘it has suffered and sacrificed’. 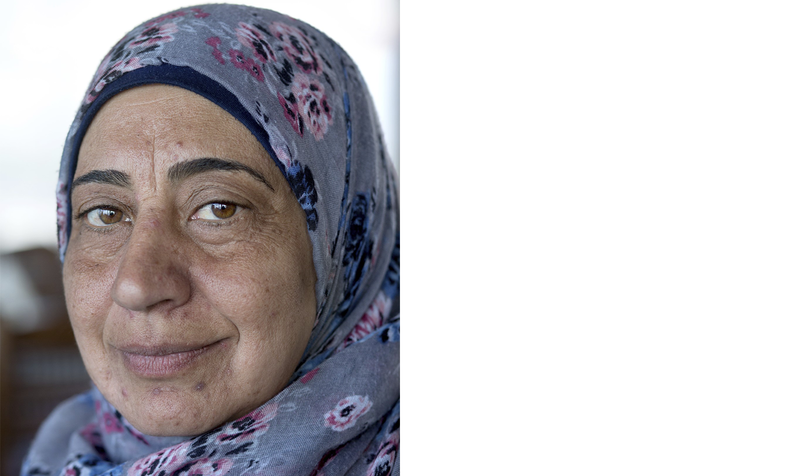 She longs to write a story of Syrians rebuilding their country and starting over again. But how much longer will this conflict continue and at what cost? The international community has provided billions of dollars and euros in aid to the region in recent years. That welcome aid has helped to keep millions of Syrian refugees alive and alleviated their suffering – but it has not kept pace with the sheer scale of human need. Read more about How can we go back to a Syria that no longer exists?